A Comparative Study to Seek for Sustainable Implementation of Silvo-Fishery Systems in Coastal Areas in Indonesia. Due to the expansion of various kinds of human impacts, a number of biological resources came to have been unsustainably exploited in many ecosystems in the world. 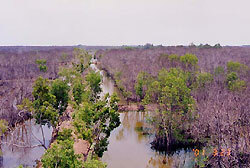 Distinction of mangrove forests is one of the most important and urgent issues among them. In particular, in Southeast Asia, expansion of shrimp culture is thought to have been the most important impact on mangrove disappearance. Under such circumstances, silvo-fishery system, a combination of mangrove plantation with coastal aquaculture, has been implemented in Indonesia, Malaysia, Vietnam, Thailand and the Philippines. 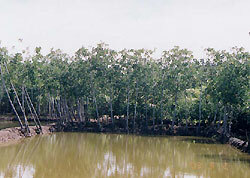 A comparative study was carried out in order to analyze the sustainability of silvo-fishery systems of mangroves and aquaculture in some selected places in Indonesia: Cikiong, West Java, where the social forestry program, in particular silvo-fishery system, was first implemented in Indonesia; Cokke, Sinjai District of South Sulawesi, where the district government adopted the Cikiong model in collaboration with the former leader of ACI group (Aku Cinta Indonesia or I Love Indonesia); Bakko of Sinjai District; and Bontotanga of Maros District in South Sulawesi. Silvo-fishery system sounds to be a suitable and better measures for managing coastal resources such as mangrove forests and fishponds. However, it is not always true that the system provides harmonized conditions between them. For example, the model adopted in Cikiong and Cokke seems to be not so sustainable as expected because of less profitability in generating local peoples' income. In case of this model, the government has paid more attention to environmental conservation than economic development, and this reflects on the land ratio of 8:2 devoted to mangroves and fishpond/ditches, respectively. Following the introduction to Cokke, the Forestry Department of Maros District extended this system to the District's coastal region in collaboration with local people. Although the initial stage of reforestation saw the harmonic collaboration between the government and the villagers, some villagers recently began to take off the seedlings because the system was not able to improve the productivity of fishponds. Besides, some of the villagers claim that the plantation disturbs the work for harvesting fish and shrimps. Taking such circumstances into consideration, this study came to note that the silvo-fishery system established in Bakko of Sinjai District, in which mangrove forests were only kept on the fishpond dikes and the outermost fringes of the fishpond areas, seems to be more sustainable model for integrating mangrove plantation and coastal aquaculture.